Has recently been discovered that building materials can absorb water large enough. It is said that these findings could then be used as the ultimate solution to tackle the problem of flooding particularly dilami by big cities. A company in the UK managed mengembangka concrete products unique. Of characteristics made in order to "devour" physical contact with the water. By the company, this unique concrete given the designation Topmix Permeable. With Topmix later surface will have a strong absorptive capacity. Therefore, the concrete foundation of the surface cover. Enables absorption rate of water will seep into the concrete and does not cause waterlogging caused the flood. 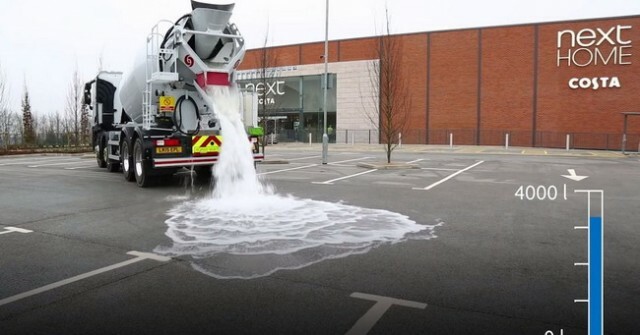 A video released to demonstrate the ability Topmix Permeable show, absorption rate of the water is able to reach 880 gallons per minute. This figure is approximately 4,000 liters of water. Most of the water is absorbed as soon as it touched the surface of the concrete. This experiment was carried out in a parking lot. Disclosed one of the developers of this magic concrete, Lafarge Tarmac, Topmix helpful Permeable anyway to make the streets safer because stagnant water can be suppressed existence. Puddles on the street often cause problems such as a vehicle that is easy to slip. Quoted from page Okezone, permeable coating on concrete gravel matrix made easily penetrate to the base of loose beneath the layer.